What's the deal with the VIOLA anyway? Ah, the viola. The most misunderstood and underestimated member of the string family. The brunt of the cruelest jokes. This is the nicest one we could find. But why is this larger cousin of the violin so maligned? The myths surrounding its history swirl, but it somehow relates to the awkward size of the instrument making it difficult to play. Historically, it was so awkward to play that viola parts were often rather simple. They didn't get the melody very often. You can think of it as the rhythm guitar in the band. The violins get all the glory playing the role of lead guitar and the cello gets to rock the bass line and the violists are stuck in the middle...and the mockery begins. But not so fast. Without this glue in the middle, the music doesn't hold together, it doesn't have any body and soul. The instruments have improved and the musicians themselves have taken on this bad reputation head on and have pushed the viola to an incredibly level of mastery. And violists themselves: the best kind of people you want to know. 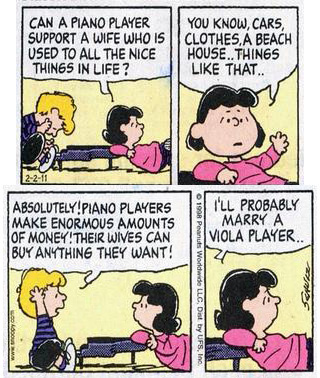 It takes something special to be a viola player. Learn more about the history here. Why are we even talking about the viola? This fall, we feature two violists on two concerts! Traditionally chamber music often features a string quartet: 2 violins, 1 viola and 1 cello. But someone had the bright idea that adding another viola to this group would make for an awesome sound. And they were right! On September 25 at The Sheldon Concert Hall, we feature a great piece by composer Kenji Bunch (who happens to also be a violist!) called String Circle which features two violas. We've played Kenji's music before, read our 2013 interview with him here. On October 14 at the Schlafly Tap Room, we feature perhaps one of the first works to add an extra viola to the ensemble: the famous Quintet in G minor by none other than the legendary Mozart. Mozart of course could play almost any instrument he touched and was a renowned pianist and violinist, but when playing with his friends, he often choose to play the viola. He was onto something! We happen to have some really fantastic violists here in St. Louis. Laura Reycraft, co-founder of Chamber Project, and Amy Greenhalgh who has been performing with us for a few years: we're excited to finally feature them playing together! We are ready to trash the bad rap of the viola with these great pieces we know you will enjoy! Don't miss this chance to hear this unique ensemble! Get your tickets! Just jump on over to our events page!